Long Island Sound is an amazing place to sail. We have hundreds of places to go including quiet anchorages, picturesque New England towns, beautiful marinas with pools and cookout grills. We also have first-class shopping, entertainment, and fine dining. It is a great place to learn because we have a lot of challenging variety including, currents, rocks, nuclear submarines, ferries, and lobster pots. 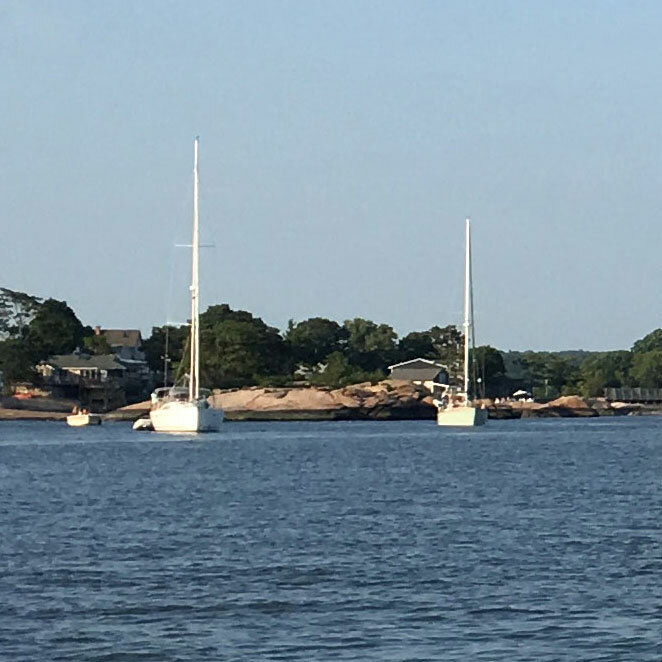 I had one person tell me that when he told the rental agent of an island charter company that he learned to sail in Long Island Sound, the guy just handed him the keys. You really learn a lot, fast, sailing on Long Island Sound. You need time on the water to become a confident sailor. Our program emphasizes hands-on time on the water. We cover the theory of course but the emphasis is on practice. Do you agree that learning should be fun, interactive and delivered in a way that provides the shortest learning curve? Sailing, just as with many other sports, requires theoretical knowledge plus hands-on practical training and experience to develop the skills required to become successful. Numerous university studies have demonstrated that a “blended” approach, featuring instructor-led training and practical exercises, provides the shortest learning curve. The venue is important also. We teach in Long Island Sound. Long Island Sound is the perfect place to learn as it has so many different challenges that you can experience with an instructor the first time to build your confidence. The following are some of the challenges you may experience during your class: Heavy and light wind, deep and shallow water, various bottom conditions for anchoring, commercial ship traffic, fog, floating and fixed docks, moorings, tide, and current. We teach on cruising boats so as an adult you don't have to start on on a small boat as the children do. Long Island Sound venue where you can experience a protected but challenging environment. We can help you learn to sail your own boat.